I am very pleased to announce the publication of the second edition of the 1970’s astrology classic on the astrology of England’s civic corporations, updated and edited by yours truly! 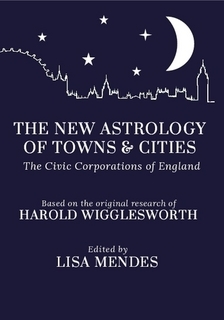 The New Astrology of Town’s & Cities, published in association with the Urania Trust, takes the much-loved 1973 classic written by Harold Wigglesworth and brings it bang up to date. Inside you’ll find an updated and extended list of the incorporation dates of England’s main towns and cities, together with key chart data (Sun, Moon, Ascending sign) for each town plus geographical co-ordinates, allowing you to easily construct your own charts for each place. The book also contains other useful facts and figures, such as ceremonial county information, Domesday Book mentions as well as a juicy Notes section, outlining the historical development of key locations from ancient burgh to market town or major city, along with alternative dates for royal charters and other important events that have made their mark on the local history of an area as it has grown and metamorphosed over time. A brand new introduction looks at the main astrological approaches to locational and mundane astrology, as well as defining key concepts, such as ‘burgh’ and ‘county,’ as they apply to England in particular, and outlines the seminal dates affecting boundary changes and laws affecting the status of local civic bodies. Drawings of several 20 key historically significant and important commercial centres, including London, Birmingham, Manchester, Liverpool, Oxford, and Cambridge, have also been included. In this way, we hope it will become something more than an astrology reference book, also offering those curious about local history an interesting compendium of information they can draw on or dip in and out of when researching or reading up on the development of their own home town or area of interest. A big thank you must go to all the Trustees of the UT for initiating the project and giving me the scope and support to give it a completely new lease on life, and to the Astrological Association for agreeing to the updated publication. Our sincere gratitude must also be extended to Sue Findlay and the Wigglesworth family for so graciously endorsing the project. Next year will be the centenary of Harold Wigglesworth’s birth – he was born in May 1914 – so it seems fitting that the book should be revised and republished now.